Our "A" size plug is, by many here in Hawaii, put directly into a four inch pot and sold in bud or spike in that same pot. Not every grower is equal and you may need to make one shift before flowering. Some varieties, here in Hawaii, will bloom in one year, but most varieties will bloom in about 1 to 2 years. "A3" indicates plants that will be ready to ship in three months. "A6" indicates plants that will be ready to ship in six months. The first letter of the plant variety identification number (R129) tells the general color of the flower. In this case, R129, it would be a red flower. Our minimum order is 100 plugs and 10 minimum per variety. Because most of our customers use their own plant label stakes we supply only enough labels to identify the plants we send (1 label per bundle of plants). We will supply labels for our plants at five cents each. These labels are .5" x 5" plastic stakes with name and our nursery code applied by heat transfer. Please let us know that you would like labels at the time of ordering. Our quantity discounts are based on annual purchases. Customer who purchse an annual volume greater than invoiced volume will be offered a credit the followin year. Payment terms: All payments are due at the time of shipping unless other arrangements have been made. Wire transfer fee is $25.00. Please add $25.00 to your payment if using wire transfers. All sales are FOB Hakalau, Hawaii. We do our best assure safe delivery. If shipments are lost or delayed some carriers will reimburse for the stated value of the shipment. USPS will not insure plants. All carriers withdraw their guarantees during times of disasters beyond their control. Please keep this in mind when choosing a shipping method. Our typical ship days are Monday and Tuesday. Box and packing fee is $22.50 per box. Because we offer over one hundred varieties, this is not representative of all. 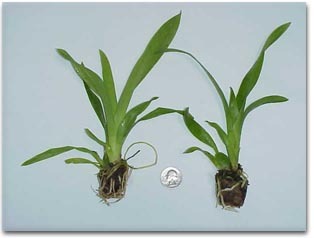 Some will have a single growth, such as Miltoniopsis, and others would be two years old and flowering when they reach this size, like Onc. ornithorhyncum or Hwra. Lavaburst. Just remember, your satisfaction is guaranteed and we want you as a regular customer. In most cases the photo is of the actual variety listed. Occasionally we won't have the photo and may substitute the photo of a similar variety for demonstration. If it is not the variety we will note "similar to". If you have a photo of something we don't and are willing to share it please let us know. If you would like to down load any photos of plants purchased directly from us, please do so, you have our permission.